The financial and political Aristocracy will continue to do more of what's failed because they have no alternative model that leaves their power and wealth intact. Frequent contributor B.C. 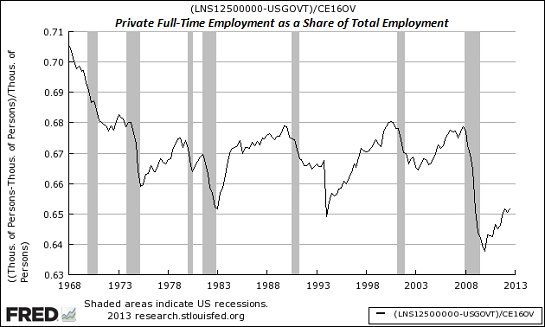 has provided five charts that reflect the hollowing out of the private-sector employment. This has profound implications for education, taxes, housing and inequality. 1. A system in which inefficient quasi-monopolies/cartels (defense, healthcare, education) are protected by a debt-based, expansionist Central State. 2. The exhaustion of the consumption/debt-based economic model. Does a ban on offshoring suddenly make it profitable to hire more employees in the U.S.? No, it doesn't. Healthcare costs are still double those of our global competitors America's Hidden 8% VAT: Sickcare (May 10, 2012), and stagnant wages and high debt levels leave few opportunities for big profits. 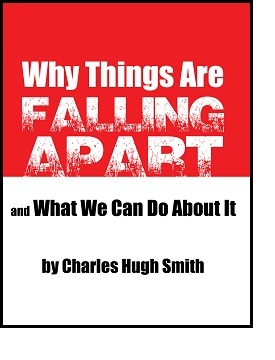 Instead of developing new products and services, corporations either slash labor costs or belly up to the State trough of favored cartels: defense, healthcare and education. 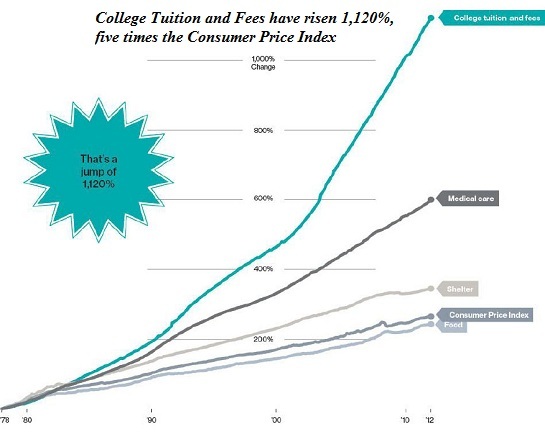 It is no mystery why these three State-protected sectors have seen costs skyrocket in a low-inflation, low-growth economy: college tuition has leaped by 1,100% above inflation and healthcare has risen 600% above the CPI (consumer price index). Once the State enforces quasi-monopolies and cartels, inefficiencies rise because the feedback from reality (i.e. price) has been severed. This is how you get an economy where a biopsy costs $70,000, new fighter aircraft cost $200+ million each (six times the previous top-of-the-line fighter) and a conventional (i.e. non-Ivy League) college education costs $120,000 - $200,000. Banning offshoring would simply create even more incentive to replace human labor with machines and software. As many observers have noted, robots are even replacing human labor in low-cost China because robots are cheaper and more productive than human labor, no matter how poorly paid. In other words, the erosion of private-sector employment has structural causes that are the consequence of the debt-burdened, crony-capitalist domestic economy and technological innovations. 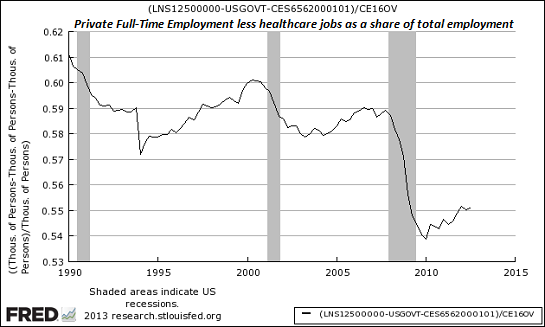 Private full-time employment minus health services jobs as a share of total employment: remove the State-protected sickcare cartel and the picture is even worse. 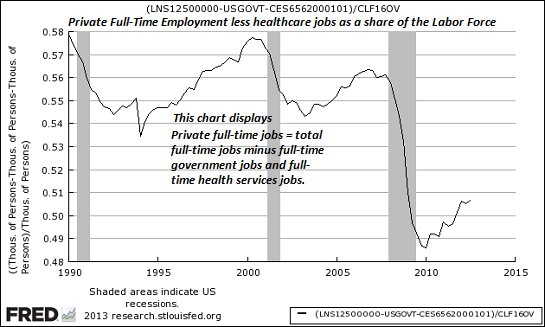 Private full-time employment minus health services jobs as a share of the total labor force: subtract government and healthcare jobs and roughly half the labor force has a private-sector job. Part-time employment as a share of total employment: roughly 1 in 5 jobs is part-time, and does not pay enough to support a household, even a one-person household. 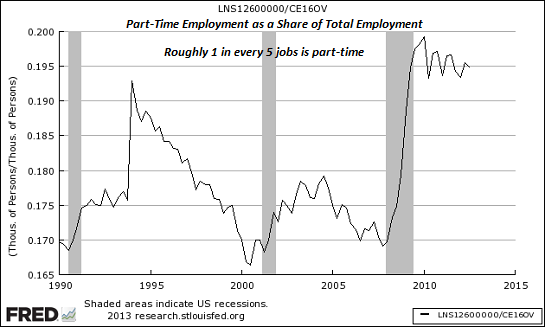 Part-time employment as a share of the total labor force: much of the vaunted increase in employment of the past four years is part-time jobs that cannot support mortgages, consumer debt, healthcare costs, auto loans, or even rent. 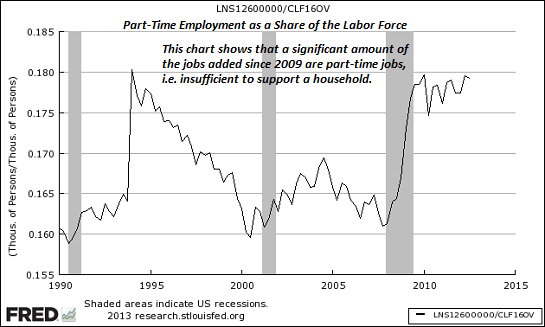 Less government and health services employment, only about half of the labor force is employed full-time. This is precisely why half of college grads are unemployed or underemployed, i.e., part-time work at low pay. Statistically, if they are not employed in government or health care, they have no more than a 50% probability of obtaining ANY full-time private employment. At ~18% of the labor force employed part-time, those 50% grads who do not obtain full-time private employment outside health care must compete for the 1 of 5 jobs in the labor force that are part-time, implying that no more than 59-60% of college grads will obtain ANY employment under current labor market conditions, leaving ~40% of grads with no prospects for earning purchasing power. Is it a surprise why student loan delinquencies have begun to soar? How will the housing market grow with as many as 40-50% of high school and college grads unemployed, underemployed, or unemployable? From my experience, perhaps as few as 10% of the population know the information above. Most in the top 10% don't know because they are largely unaffected and thus don't care and will not be persuaded that they should care until they have to (i.e. when their children experience the aforementioned conditions). The vast majority of the bottom 90% don't know because they spend their waking hours trying to survive and can't do anything about it were they to know. Those who do know tend to be well-positioned economists, politicians, and similar types who have no financial or professional incentives to share the information because no one in the top 1-10% cares to know or do anything about it. How do you maintain a mass-consumer, debt-based economy with only half of the labor force with full-time private employment outside of health care, accelerating automation of labor and loss of incomes and purchasing power, 40% of the youth with little or no purchasing power, and 90% of the population relying in old age on transfer payments from the wages of younger wage earners and their struggling employers? You can't. So the mass-consumer economy and welfare-state for the bottom 90%, elderly, underemployed, disabled, young, and poor is not sustainable. Now what? 1. Healthcare, defense and education are all bubbles that are about to burst as debt-based government spending must slow, and this means the "you have a guaranteed job in this sector" mindset that has been true for the past 50 years will change. Rather than obtain a guaranteed full-time job, those entering these fields (other than M.D.s, in which a critical shortage looms large) will be competing with vast hordes of other job seekers who also believed these were "safe" careers. The same can be said of law, as the era of "Big Law" is over as large law firms shed attorneys and reduce compensation. BigLaw Growth is Dead: Here's What's Next. 2. Sickcare acts as a systemic tax, as does the cartel defense industry. Politicians love defense and healthcare spending because they believe it "creates jobs." But since these are largely unproductive mal-investments, for reasons I have highlighted here many times, State spending on these sectors is extraordinarily ineffective at creating not just jobs but productive investments of labor and capital. To take but one example of thousands: western Pennsylvania has about as many MRI machines than the entire nation of Canada. Those who own the machines funnel thousands of people into their labs to take unnecessary or duplicative MRI tests as a profit-mill. Since the State (Medicaid and Medicare) and insurance will pay for any and all tests deemed "necessary" in a system that revolves around defensive medicine, i.e. doing whatever it takes to avoid future lawsuits, this waste makes perfect sense in terms of generating profits. According to local media reports, Western Pennsylvania has about 140 MRI machines, while the 32 million residents of Canada share 151 MRI machines. And the machines are getting a lot of use: the number of CT and MRI scans (scans other than old-fashioned X rays) tripled from 85 to 234 per thousand insured people since 1999. While proponents are quick to note that scans are cheaper than the alternative diagnostic procedures, one firm's research found that a doctor who owns his own machine is four times as likely to order a scan as a doctor who doesn't. Add in massive amounts of fraud (billing Medicare for tests that were not even given) and 40% of the system costs wasted on paper-shuffling, and you have a system that is literally crippling the entire U.S. economy with its high costs, fraud and waste. 3. Where does the leadership of our multiple layers of government think future tax increases will come from when private sector employment is eroding and half of all college graduates are unemployed or earning low pay in part-time jobs? The wage-base for higher taxes to pay for ballooning entitlements is eroding, too. 4. We suffer from a systemic failure of imagination. The financial and political Aristocracy that rules the neofeudal, financialized economy have no other model other than debt-based misallocation of capital and endless growth of debt-based consumption. That this model is broken and cannot possibly get us where we need to go does not matter; they will continue to do more of what's failed because they have no alternative model that leaves their power and wealth intact. Thank you, Lynn M. ($75), for yet another magnificently generous contribution to this site -- I am greatly honored by your steadfast support and readership. Thank you, Ann K. S. ($25), for your wondrously generous contribution to this site --I am greatly honored by your support and readership.